Beautiful & Spacious Family Sized Victorian Home With Soaring Ceilings And Living Space Galore Boasting Two Family Rooms, Large Separate Dining Room, First Floor Washroom,Third Floor Master Bedroom W/ Ensuite, Walk-In Closet & Possible Roof Top Deck . Hardwood & Tile Throughout. Huge Private Deck In The Backyard W/ Room For Picnic Table On The Grass And A Veg Garden! 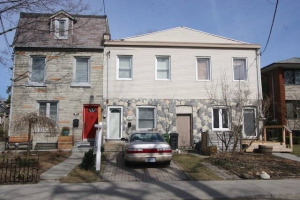 Fantastic Roncey Neighbourhood W/ Farmers Market, Parks, Coffee Shops, Restaurants,Ttc.